"I knew I would love my Mya-Moe madly, and I do. So little, so pretty, so easy to play, such good tone. My Band mates are totally jealous. " Bernice Lewis has been a national touring artist for three decades. Her performing resume includes almost every grassroots and established venue in the U.S,, including the Kerrville Folk Festival, the Winnipeg Folk Festival, the Kennedy Center, NPR's Mountain Stage, etc. She is a Singer/Songwriter, a published poet, a producer and recording artist with six albums to her credit, and an educator extraordinaire. 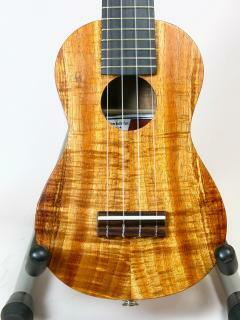 She is also a founding member of The Ladies Auxiliary Ukulele Orchestra. Formed in 1994, the trio also includes composer and teacher Cathy Schane-Lydon, and artist Sarah McNair. Close-cropped harmonies and unrestrained ukulele strumming produce a highly original sound. Their sets boast something from every era, ranging from Mozart to Led Zeppelin, the Brill Building to Radiohead. Over the years, Bernice has worked with Dar Williams, Bobby McFerrin, Rosanne Cash, Guy van Duser, Peter, Paul, and Mary, the Dixie Chicks, Christine Lavin, Patty Griffin, Patty Larkin...the list is endless. For five summers, she was employed as Campus Bard at the Omega Institute in Rhinebeck, NY. In 2009, she was awarded an Artist in Residence position by the National Park Service. She is a Research Associate of Music at Williams College in Williamstown, MA, where she currently teaches songwriting and Performing. 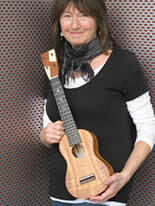 She also teaches at Colorado College, as well as at school residencies, song camps, and retreat centers. She's had a thirty-year daily yoga practice, loves good coffee, and her religion is the Grand Canyon.